Comtronix Design provides Contract Design engineering services to industry. Our specialty is Electrical and Electronics Engineering with emphasis on the measurement, control, mechanism, optic and thermal disciplines. We provide practical, product and test oriented engineering knowhow based on over 30 years experience in the Commercial, Industrial and Aero-Space industries. Comtronix Design offers engineering support from concept discovery through to production. Typical efforts include system engineering analysis, detailed schematic design, software design, prototyping, printed wiring board design, production test equipment design / fabrication, test procedure preparation and product manuals. Please visit the pages below for additional detail. Recent Technical Activities This page provides a brief resume of technical activities since 1994. Contract Design What is Contract Design and what can it do for the client? Product Planning Steps Product engineering always involves a well thought-out plan. Development Steps A narrative of technology subjects. Typical Applications Technology experience areas. 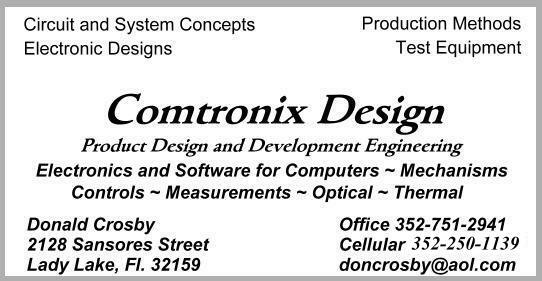 Send e-mail to Donald Crosby at Comtronix Design with your interests. Comtronix Design is the successor business to Altima Services, LLC. Altima Services was established in 1994 as a Connecticut based business. Comtronix Design was established in Charlotte County, Florida in 1998. The business relocated to Sumter County, Florida since 2003.